After seeing my favorite Black Stars agonisingly hit the goal post three times in the opening game of CAN 2008 and remain deadlocked with Guinea, I began wondering if this victory was to be. We finally scored and then the Syli Nationale replied almost immediately. Just when I was about to give up, Sulley Muntari produced a moment of magic two minutes to time and scored the winner. Ghana's biggest newspaper, the Daily Graphic, said sometimes one is tempted to believe that God is a Ghanaian. Apparently, God was on our side, and Esther Smith would agree with her song 'Yesu wo m'afa'. No matter how many heartbreaking missed chances we suffered, we would win in the end. It is with much excitement that I dismiss dis missive to you. That's why I like you Kwame, even when my English is sketchy, you can sketch what I want to say in your medulla oblongata. 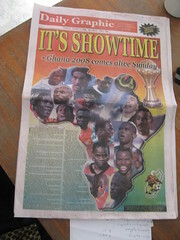 :-) The 26th African Cup of Nations begins in your homeland on Sunday and is the source of my excitement. 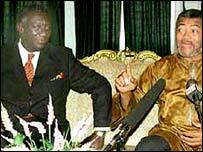 Allow me to be late to congratulate you on your shepherding Ghana's Africa Cup of Nations triumphs in 1963 and 1965. You are really great, all the tournaments that Ghana took part in your tenure as president resulted in glory and more glory. I am one of Obrafour's biggest fans. I travelled a number of miles away to buy his latest album, Heavy. The title track dominated the Ghanaian charts in 2006 and rightly so. I hadn't paid much attention to what he meant by 'heavy, heavy', until my little cousin passed a comment about her fears in becoming fat if she eats too much. Then it dawned on me. Obrafour uses 'heavy' to mean 'great, nice', etc. But in today's 'watch your weight world', who wants to be 'heavy'? Home is where I find the most peace but all is not peaceful. News broadcasts in Ghana are as common as every top of the hour. I have known Ghanaian news broadcasts to provide good news; hospital building commissionings, speech and prize giving days, and price increases. Call it boring if yu may please but once in a while we have news to 'tickle' you. My friends in Bawku have some 'tickling' news to report, some of their friends have taken to the streets and have left in their wake some dead bodies. "If my brother dey struggle for Kenya, I be Kenyan oh" - Wanlov sang about it, but if my brother is suffering in Kenya, I feel the ripples, I feel the pain. It could happen in my backyard, Bawku is not exactly my backyard, but it is. I was sitting in a trotro heading towards Adenta after a long day in Adabraka. I headed out knowing that it would take me a while to complete my journey due to traffic. When the trotro got to the HIPIC junction, I found myself thinking and thinking really hard. I just wanted to get home soon but the journey was long, quiet and pensive. All four lanes were filled and moving at a go-slow pace. As we approached the Tetteh Quarshie Interchange, we were still moving so slow, I wondered how bad this situation would be if we still had the Tetteh Quarshie roundabout which had only one lane. 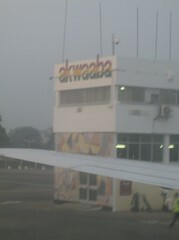 No be small thing o.
I can't tell you how happy I feel to be in Ghana. Yes, it is home, but it is where I find the most peace. When there is a boring moment, I am thinking. When there is a sad moment, I am thinking. 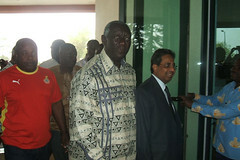 When there is a happy moment, I am not thanking anyone, because it is just routine when I am in Ghana. I must be selling Ghana to you and it's no secret why I may be doing so at this particular time, with the African Cup of Nations underway in Ghana in just over two weeks, every inch of Ghana is being sold. On the back of Ghana's golden jubilee, Ghana wants as many people to be in Ghana. Wanlov is no different. Wanlov aka One love aka Odo Baako aka Sumo ekome is a Ghanaian musician. The son of Ghanaian father and Romanian mother, he wouldn't strike you as Ghanaian on first glance. You will find it difficult to place him under one genre - he's that good. Wanlov had been stationed in the US for awhile now and just returned to Ghana late last year. He had spent the most of his time abroad making singles, touring the US and performing. I vividly remember him doing a show in a college in Connecticut and then performing in California the next weekend. 'In Ghana' is one of the tracks on his debut release, Green card' which is out now. 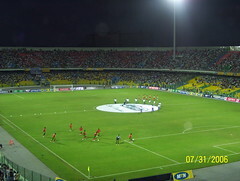 'In Ghana' gained popularity in late 2006 after Ghana's debut at the World Cup, it was one of the songs promoting Ghana. Read the lyrics and it's easy to see why, the Ministry of Tourism must hear this one. In a comment to anti-social-bookmarking, Joitske Hulsebosch pointed out webmark - an online bookmark manager by Henry Addo.